Dr. Patel will review your medical history and perform a complete physical examination. Diagnostic studies may also be ordered such as X-rays, MRI or CT scan to assist in diagnosis. 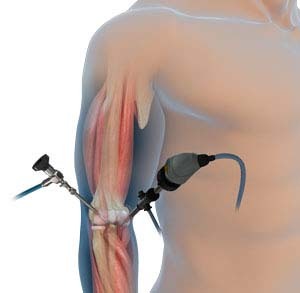 Several tiny incisions are made to insert the arthroscope and small surgical instruments into the joint. To enhance the clarity of the elbow structures through the arthroscope, Dr. Patel will fill the elbow joint with a sterile liquid. The liquid flows through the arthroscope to maintain clarity and also to restrict any bleeding. The camera attached to the arthroscope displays the internal structures of the elbow on the monitor and helps Dr. Patel to evaluate the joint and direct the surgical instruments to fix the problem. At the end of the procedure, the surgical incisions are closed by sutures, and a soft sterile dressing is applied. Dr. Patel will place a cast or a splint to restrict the movement of the elbow. Dr. Patel will prescribe pain medications to keep you comfortable.